This vehicle was involved in a serious motor vehicle crash in Manchester on Tuesday. A New Hampshire man was arrested on an outstanding warrant Tuesday after he was pulled over by state police for taking cell phone pictures of an accident scene as he drove by it. Allen Buco, 26, of Manchester, was taking cell phone pictures of a burned vehicle following an accident on Interstate 93 in Manchester. A state police trooper observed Buco taking the video while driving and initiated a motor vehicle stop. Buco was cited for use of a mobile electronic device while driving, and during the stop, the trooper also determined that Buco had an active warrant out of Raymond and he was arrested at the scene. 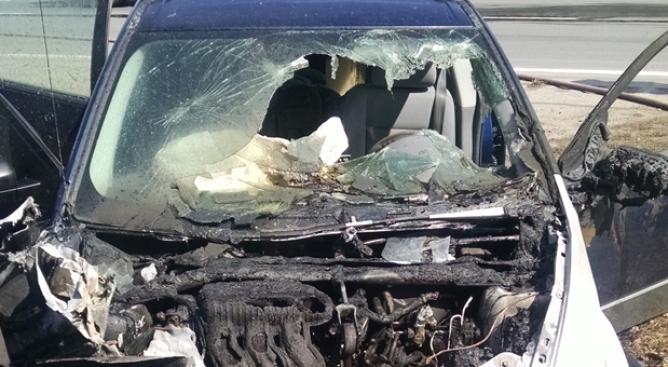 The accident occurred around 10:30 a.m., when a car crashed into a sound barrier wall on I-93 south and caught on fire. The passenger, Gary Huber, 40, of Haverhill, Massachusetts, was not wearing a seatbelt and was partially ejected out the front windshield. He suffered serious, but non-life-threatening injuries. The driver, 28-year-old Jessica Scales of Derry, New Hampshire, was wearing a seatbelt and suffered minor injuries. The right travel lane on I-93 south was shut down for about 90 minutes as a result of the crash.